In October 2016, the former Minister of Health released the Healthy Eating Strategy as part of the Government’s vision of a healthy Canada. A part of the Strategy is a commitment by Health Canada to engage the public and stakeholders to get input on a number of interlocking initiatives to improve the food environment. One of these initiatives includes a front-of-package (FOP) labelling approach aimed at helping Canadians make healthier and more informed food choices, particularly on sugars, sodium and saturated fat. On September 18, 2017, Health Canada brought together industry and health stakeholders, as well as academic and international experts to share and review evidence and to explore options for FOP symbols for further consultation. Health Canada representatives opened the meeting by indicating that diet-related chronic diseases are a major health problem, specifically diets high in sugars, sodium, and saturated fat. Canadians face a number of healthy eating challenges, which are being addressed by the Healthy Eating Strategy. Part of the Strategy is improving the information on food labels and FOP labelling. 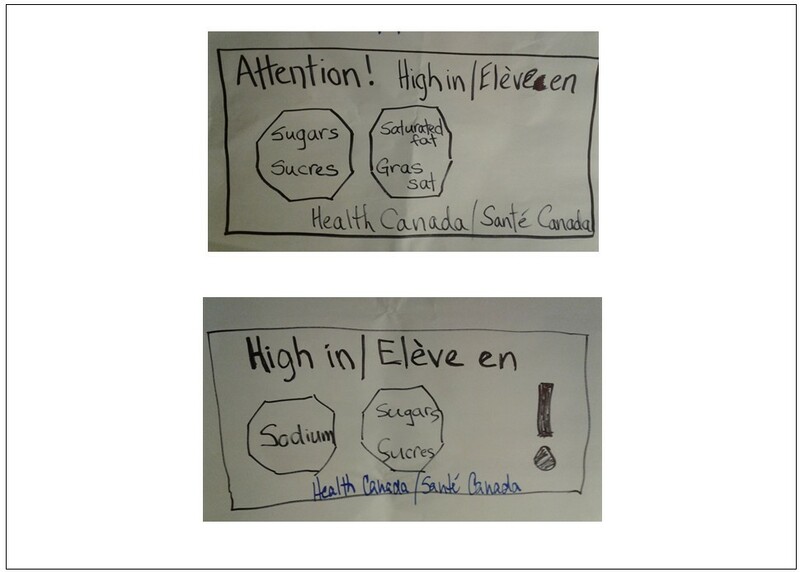 Health Canada has proposed FOP ‘high in’ nutrition symbols that would help consumers identify foods high in sugars, sodium, and saturated fat, and that could drive reformulation of some of these products, so they contain lower levels of these nutrients. Health Canada consulted on proposed symbols for a ‘high in’ FOP labelling approach through a pre-regulatory online consultation conducted in the fall of 2016. In October, 2016, the former Minister of Health released a Healthy Eating Strategy, as part of the Government’s vision of a healthy Canada, in response to several food and nutrition commitments outlined in the 2015 Mandate Letter from the Prime Minister of Canada. The Strategy ties Health Canada’s ongoing nutrition efforts with new, complementary initiatives to make it easier for Canadians to choose healthier food options. The Strategy states that Canadians ‘need to have the right tools to access, understand and use nutrition information to make healthier choices’. For this reason, Health Canada proposed a front-of-package (FOP) labelling approach aimed at helping Canadians make healthier and more informed food choices, particularly with respect to sugars, sodium and saturated fat. Over 1800 stakeholders registered in Health Canada’s Stakeholder Registry were invited to participate in the meeting via live web streaming; there were over 300 registered connections. Viewers could see presentations and hear discussions; a number of them also contributed questions to the discussions. Representatives of other government departments and agencies (Global Affairs Canada, Justice Canada, Agriculture and Agri-Food Canada, Canadian Food Inspection Agency, and the Public Health Agency of Canada) were invited as observers. The criteria that were selected, i.e., ‘High in’ and the three nutrients of public health concern, were identified based on a review of the evidence to help consumers make quick and easy decisions about foods they purchase and decrease diet-related disease risk factors. The strengths and weaknesses of different ‘High in’ symbol options were considered through a pre-regulatory online consultation (> 1500 comments were received), focus group testing, scientific evidence, and a cost benefit analysis with industry. RCC expressed concerns about the thresholds and the three-nutrient focus. However, they want to be part of the solution and provided some suggested approaches that still met Health Canada’s criteria. RCC’s proposed ‘Check the NFt’ symbols (Figure 1) would meet the Health Canada specified criteria. These symbols have vertical or horizontal variations which allow for design flexibility and refer consumers to the Nutrition Facts table for more information. On the left are three examples for the first set labelled ‘Design Option A’. The first example contains a black and white magnifying glass icon with the text ‘% DV’ in black font inside the lens. Extending to the right of the magnifying glass are two rounded rectangles side by side. The rectangles are white with a black outline. The first rectangle contains the word ‘SUGARS’ on top of the word ‘SUCRES’ in bold capital black font. The second rectangle contains the words ‘SAT FAT’ on top of the words ‘GRAS SAT’ in bold capital black font. The second example contains a magnifying glass icon with the text ‘% DV’ inside the lens. Extending below it is a rounded rectangle containing the word ‘SUGARS’ on top of the word ‘SUCRES’ in bold capital black font. The rectangle is white with a black outline. The third example contains a magnifying glass icon with the text ‘% DV’ inside the lens. Extending below it is three vertically stacked rounded rectangles. The rectangles are white with a black outline. The top rectangle contains the word ‘SUGARS’ on top of the word ‘SUCRES’ in bold capital black font. The middle rectangle contains the words ‘SAT FAT’ on top of the words ‘GRAS SAT’ in bold capital black font. The bottom rectangle contains the word ‘SODIUM’ in bold capital black font. On the right are three examples of the second set labelled ‘Design Option B’. These examples are similar to the examples in Design Option A, but do not contain the text ‘%DV’ in the magnifying glass lens. The first example contains a black and white magnifying glass icon. Extending to the right of the magnifying glass are two rounded rectangles side by side. The rectangles are white with a black outline. The first rectangle contains the word ‘SUGARS’ on top of the word ‘SUCRES’ in bold capital black font. The second rectangle contains the words ‘SAT FAT’ on top of the words ‘GRAS SAT’ in bold capital black font. The second example contains a magnifying glass icon. Extending below it is a rounded rectangle containing the word ‘SUGARS’ on top of the word ‘SUCRES’ in bold capital black font. The rectangle is white with a black outline. The third example contains a magnifying glass icon. Extending below it is three vertically stacked rounded rectangles. The rectangles are white with a black outline. The top rectangle contains the word ‘SUGARS’ on top of the word ‘SUCRES’ in bold capital black font. The middle rectangle contains the words ‘SAT FAT’ on top of the words ‘GRAS SAT’ in bold capital black font. The bottom rectangle contains the word ‘SODIUM’ in bold capital black font. FCPC expressed concerns with Health Canada’s process to develop a FOP nutrition labelling system and feels that the Healthy Eating Strategy initiatives unfairly target the food processing industry. FCPC expressed concern that Health Canada’s proposed symbol appears not to have been modified in light of feedback that was provided by stakeholders in response to the November 2016 consultation. In response to that consultation, FCPC had proposed that Health Canada adopt ‘Facts Up Front’ (Figure 2), an industry-led FOP approach that has been adopted by a number of multinational companies operating in the United States and Canada. This figure contains the Facts Up Front symbol proposed by FCPC. The symbol shows a light blue rectangle. Within the rectangle, the words ‘PER 1 CUP SERVING – PAR PORTION 1 TASSE’ in bold capital black font appear along the top. Below the text are six thumbnail shapes in white side by side. The first thumbnail contains the text ‘140’ in bold black font on top of the word ‘CALORIES’ in bold capital black font. The second thumbnail contains the text ‘1g’ in black font on top and just below it are the words ‘SAT FAT’ on top of the words ‘GRAS SATURÉS’ in bold capital black font. At the bottom is a horizontal black pointed oval shape with the text ‘5% DV/VQ’ in bold capital white font. The third thumbnail contains the text ‘410mg’ in black font on top of the word ‘SODIUM’ in bold capital black font. At the bottom is a horizontal black pointed oval shape with the text ‘17% DV/VQ’ in bold capital white font. The fourth thumbnail contains the text ‘5g’ in black font on top. Below it is word ‘SUGARS’ on top of the word ‘SUCRES’ in bold capital black font. The fifth thumbnail contains the text ‘1000mg’ in black font on top of the word ‘POTASSIUM’ in bold capital black font. At the bottom is a horizontal black pointed oval shape with the text ‘29% DV/VQ’ in bold capital white font. The last thumbnail contains the word ‘VITAMIN’ on top of the word ‘VITAMINE’ in bold capital black font. Below this is the letter ‘A’ in large bold capital black font. At the bottom is a horizontal black pointed oval shape with the text ‘20% DV/VQ’ in bold capital white font. The first symbol, in the top left, is the Facts Up Front symbol. The symbol shows a light blue rectangle. Within the rectangle are four thumbnail shapes in white side by side. The first thumbnail contains the text ‘140’ in bold black font on top of the word ‘CALORIES’ in bold capital black font. The second thumbnail contains the text ‘1g’ in black font on top and just below it are the words ‘SAT FAT’ on top of the words ‘GRAS SATURÉS’ in bold capital black font. At the bottom is a horizontal black pointed oval shape with the text ‘5% DV/VQ’ in bold capital white font. The third thumbnail contains the text ‘410mg’ in black font on top of the word ‘SODIUM’ in bold capital black font. At the bottom is a horizontal black pointed oval shape with the text ‘17% DV/VQ’ in bold capital white font. The fourth thumbnail contains the text ‘5g’ in black font on top. Below it is word ‘SUGARS’ on top of the word ‘SUCRES’ in bold capital black font. The second symbol, in the top right, is a traffic light Facts Up Front symbol. It contains four thumbnail shapes with black outlines side by side. The first thumbnail contains the text ‘Calories’ in bold mixed-case black font on top of the number ‘100’ in bold black font. The second, third and fourth thumbnails are divided in the middle by a horizontal black line. The top of the second thumbnail is orange with the words ‘Sat fat’ on top of the words ‘Gras sat’ in bold mixed case black font. The bottom of the second thumbnail is white with the text ‘4g’ in bold black font. Below it is a black circle with the text ‘20%’ on top of the text ‘DV/VQ’ in capital white font. The top of the third thumbnail is green with the word ‘Sugars’ on top of the word ‘Sucres’ in bold mixed case black font. The bottom of the third thumbnail is white with the text ‘5g’ in bold black font. Below it is a black circle with the text ‘5%’ on top of the text ‘DV/VQ’ in capital white font. The top of the last thumbnail is red with the word ‘Sodium’ in bold mixed case black font. The bottom of this thumbnail is white with the text ‘920mg’ in bold black font. Below it is a black circle with the text ‘40%’ on top of the text ‘DV/VQ’ in capital white font. The third symbol, in the bottom left, is a modified Facts Up Front symbol in black and white. It contains four white thumbnail shapes with black outlines side by side. The first thumbnail contains the text ‘Calories’ in bold mixed-case black font on top of the number ‘100’ in bold black font. The second, third and fourth thumbnails are divided in the middle by a horizontal black line. The top half of the second thumbnail contains the word ‘Moderate’ on top of the words ‘Quantité modérée’ in mixed case black font. Just below is the words ‘Sat fat’ on top of the words ‘Gras sat’ in bold mixed case black font. The bottom of the second thumbnail contains the text ‘4g’ in bold black font. Below it is a black circle with the text ‘20%’ on top of the text ‘DV/VQ’ in capital white font. The top half of the third thumbnail contains the words ‘A Little’ on top of the word ‘Peu’ in mixed case black font. Just below is the word ‘Sugars’ on top of the word ‘Sucres’ in bold mixed case black font. The bottom of the third thumbnail contains the text ‘5g’ in bold black font. Below it is a black circle with the text ‘5%’ on top of the text ‘DV/VQ’ in capital white font. The top half of the fourth thumbnail contains the words ‘A Lot’ on top of the word ‘Beaucoup’ in mixed-case black font. Just below is the word ‘Sodium’ in bold mixed case black font. The bottom of this thumbnail contains the text ‘920mg’ in bold black font. Below it is a black circle with the text ‘40%’ on top of the text ‘DV/VQ’ in capital white font. The fourth symbol, in the bottom right, is a modified traffic light Facts Up Front symbol. It contains four thumbnail shapes with black outlines side by side. The first thumbnail is white and contains the text ‘Calories’ in bold mixed-case black font on top of the number ‘100’ in bold black font. The second, third and fourth thumbnails are divided in the middle by a horizontal black line. The top half of the second thumbnail is orange and contains the word ‘Moderate’ on top of the words ‘Quantité modérée’ in mixed case black font. Just below is the words ‘Sat fat’ on top of the words ‘Gras sat’ in bold mixed case black font. The bottom of the second thumbnail is white and contains the text ‘4g’ in bold black font. Below it is a black circle with the text ‘20%’ on top of the text ‘DV/VQ’ in capital white font. The top half of the third thumbnail is green and contains the words ‘A Little’ on top of the word ‘Peu’ in mixed case black font. Just below is the word ‘Sugars’ on top of the word ‘Sucres’ in bold mixed case black font. The bottom of the third thumbnail is white and contains the text ‘5g’ in bold black font. Below it is a black circle with the text ‘5%’ on top of the text ‘DV/VQ’ in capital white font. The top half of the fourth thumbnail is red contains the words ‘A Lot’ on top of the word ‘Beaucoup’ in mixed-case black font. Just below is the word ‘Sodium’ in bold mixed case black font. The bottom of this thumbnail is white and contains the text ‘920mg’ in bold black font. Below it is a black circle with the text ‘40%’ on top of the text ‘DV/VQ’ in capital white font. CBA indicated that fact-based FOP labelling has already been implemented, or proposed, in many countries on a voluntary basis. Fact-based FOP labelling is mandatory in Mexico and Thailand – only Chile has a mandatory interpretive system. Don’t necessarily think they will change their choices, knowing that there are healthier options available. More than 59% preferred the colour-coded ‘Facts up Front’ model compared to the Health Canada’s ‘High in’ symbol (Figure 5) and the non-colour coded ‘Facts Up Front’. This was consistent over gender, age, income level, and political preference. The set of three symbols on the left are labelled ‘Split A (seen by half of respondents)’. The first symbol in this set is the modified traffic light Facts Up Front symbol. This symbol contains four thumbnail shapes with black outlines side by side. The first thumbnail is white and contains the text ‘Calories’ in bold mixed-case black font on top of the number ‘100’ in bold black font. The second, third and fourth thumbnails are divided in the middle by a horizontal black line. The top half of the second thumbnail is orange and contains the word ‘Moderate’ on top of the words ‘Quantité modérée’ in mixed case black font. Just below is the words ‘Sat fat’ on top of the words ‘Gras sat’ in bold mixed case black font. The bottom of the second thumbnail is white and contains the text ‘4g’ in bold black font. Below it is a black circle with the text ‘20%’ on top of the text ‘DV/VQ’ in capital white font. The top half of the third thumbnail is green and contains the words ‘A Little’ on top of the word ‘Peu’ in mixed case black font. Just below is the word ‘Sugars’ on top of the word ‘Sucres’ in bold mixed case black font. The bottom of the third thumbnail is white and contains the text ‘5g’ in bold black font. Below it is a black circle with the text ‘5%’ on top of the text ‘DV/VQ’ in capital white font. The top half of the fourth thumbnail is red contains the words ‘A Lot’ on top of the word ‘Beaucoup’ in mixed-case black font. Just below is the word ‘Sodium’ in bold mixed case black font. The bottom of this thumbnail is white and contains the text ‘920mg’ in bold black font. Below it is a black circle with the text ‘40%’ on top of the text ‘DV/VQ’ in capital white font. The second symbol in this set contains a black octagon with a large white exclamation mark in the middle. Three black bars extend out from the right side of the octagon. The top black bar contains the words ‘Sugars/Sucres’ in white font, the middle black bar contains the words ‘Sat fat/Gras sat’ in white font, and the bottom black bar contains the word ‘Sodium’ in white font. The words ‘High in/Élevée en’ in black font sit above the octagon and bars. The octagon, bars, and the words together are outlined by a thin grey line. The third symbol in this set is the modified Facts Up Front symbol in black and white. It contains four white thumbnail shapes with black outlines side by side. The first thumbnail contains the text ‘Calories’ in bold mixed-case black font on top of the number ‘100’ in bold black font. The second, third and fourth thumbnails are divided in the middle by a horizontal black line. The top half of the second thumbnail contains the word ‘Moderate’ on top of the words ‘Quantité modérée’ in mixed case black font. Just below is the words ‘Sat fat’ on top of the words ‘Gras sat’ in bold mixed case black font. The bottom of the second thumbnail contains the text ‘4g’ in bold black font. Below it is a black circle with the text ‘20%’ on top of the text ‘DV/VQ’ in capital white font. The top half of the third thumbnail contains the words ‘A Little’ on top of the word ‘Peu’ in mixed case black font. Just below is the word ‘Sugars’ on top of the word ‘Sucres’ in bold mixed case black font. The bottom of the third thumbnail contains the text ‘5g’ in bold black font. Below it is a black circle with the text ‘5%’ on top of the text ‘DV/VQ’ in capital white font. The top half of the fourth thumbnail contains the words ‘A Lot’ on top of the word ‘Beaucoup’ in mixed-case black font. Just below is the word ‘Sodium’ in bold mixed case black font. The bottom of this thumbnail contains the text ‘920mg’ in bold black font. Below it is a black circle with the text ‘40%’ on top of the text ‘DV/VQ’ in capital white font. The set of three symbols on the right are labelled ‘Split B (seen by half of respondents)’. The first symbol in this set is traffic light Facts Up Front symbol. It contains four thumbnail shapes with black outlines side by side. The first thumbnail contains the text ‘Calories’ in bold mixed-case black font on top of the number ‘100’ in bold black font. The second, third and fourth thumbnails are divided in the middle by a horizontal black line. The top of the second thumbnail is orange with the words ‘Sat fat’ on top of the words ‘Gras sat’ in bold mixed case black font. The bottom of the second thumbnail is white with the text ‘4g’ in bold black font. Below it is a black circle with the text ‘20%’ on top of the text ‘DV/VQ’ in capital white font. The top of the third thumbnail is green with the word ‘Sugars’ on top of the word ‘Sucres’ in bold mixed case black font. The bottom of the third thumbnail is white with the text ‘5g’ in bold black font. Below it is a black circle with the text ‘5%’ on top of the text ‘DV/VQ’ in capital white font. The top of the last thumbnail is red with the word ‘sodium’ in bold mixed case black font. The bottom of this thumbnail is white with the text ‘920mg’ in bold black font. Below it is a black circle with the text ‘40%’ on top of the text ‘DV/VQ’ in capital white font. Industry felt strongly that there needs to be a clear link with the information in the NFt and that this should remain the principle source of balanced information for consumers to make informed choices. There was concern that HC’s proposal could divert attention from the NFt by providing too much of a shortcut to making purchase decisions. A counterpoint was made that nutrient content and health claims also divert attention from the NFt, particularly when consumers are making choices very quickly while shopping. If a colour-coded scheme such as the one proposed by FCPC (Figure 3- modified ‘Facts Up Front’) was to be put into place, a graded set of thresholds would be required that would also align with nutrient content claims. Health Canada was asked to consider extending the timelines for the regulatory project in order to do further focus group testing with RCC’s proposal (Figure 1- FOP ‘Check the NFt’ symbol options). Foods with ‘positive’ FOP symbols are perceived to be better. About half of all foods sold in Canada have FOP messages, mainly in the form of nutrient content claims. The information should be interpretive. Symbols that show guideline daily amounts (non-interpretive) (for example, the ‘Facts Up Front’ labels shown in Figures 2 and 3) are out-performed by more interpretive ones. For traffic light labelling (semi-interpretive), it has been shown that foods that have a red are avoided and that two greens out-performs a red. With star rating systems (semi-interpretive) there is confusion about the meaning of no stars (is it good or bad). Warning labels (most interpretive) allow consumers to make faster decisions. The label should be simple, so that no nutritional knowledge is required, and it should be interpretive, with information provided as guidance, rather than specific facts. The ‘Facts Up Front’ label (Figures 2 and 3) is neither simple nor interpretive, while the magnifying glass (Figure 1) just points back to the NFt, which is troublesome to understand. One third to one half of consumers do not understand health star ratings. The traffic light symbol is interpretive, but could provide misleading information if there are two greens and one red. The ‘high in’ symbol, used in Chile, is the simplest and most interpretive. It is the most effective for avoiding unhealthy foods and rated highest amongst consumers when asked what additional information they would like to see on food products (79% would support a government policy that would require a symbol for ‘high in sugar’ on the front of package labels). A decision on a food purchase is made in 4 to 8 seconds. Persuasive elements on the label include characters from children’s stories, images and references to fresh fruit and vegetables, and nutrient content and health benefit claims. In Chile, warning symbols, plus the elimination of licensed characters from food labels, became mandatory in 2016. Also products labelled ‘high in’ are banned from schools and have advertising restrictions. Symbol 1 contains a set of three examples of a front-of-package symbol design with magnifying glasses. The first example contains a black and white magnifying glass icon with the text ‘% DV’ in black font inside the lens. Extending to the right of the magnifying glass are two rounded rectangles side by side. The rectangles are white with a black outline. The first rectangle contains the word ‘SUGARS’ on top of the word ‘SUCRES’ in bold capital black font. The second rectangle contains the words ‘SAT FAT’ on top of the words ‘GRAS SAT’ in bold capital black font. The second example contains a magnifying glass icon with the text ‘% DV’ inside the lens. Extending below it is a rounded rectangle containing the word ‘SUGARS’ on top of the word ‘SUCRES’ in bold capital black font. The rectangle is white with a black outline. The third example contains a magnifying glass icon with the text ‘% DV’ inside the lens. Extending below it is three vertically stacked rounded rectangles. The rectangles are white with a black outline. The top rectangle contains the word ‘SUGARS’ on top of the word ‘SUCRES’ in bold capital black font. The middle rectangle contains the words ‘SAT FAT’ on top of the words ‘GRAS SAT’ in bold capital black font. The bottom rectangle contains the word ‘SODIUM’ in bold capital black font. Symbol 2 contains a set of three examples of another front-of-package symbol design with magnifying glasses. These examples are similar to the examples shown in Symbol 1, but do not contain the text ‘%DV’ in the magnifying glass lens. The first example contains a black and white magnifying glass icon. Extending to the right of the magnifying glass are two rounded rectangles side by side. The rectangles are white with a black outline. The first rectangle contains the word ‘SUGARS’ on top of the word ‘SUCRES’ in bold capital black font. The second rectangle contains the words ‘SAT FAT’ on top of the words ‘GRAS SAT’ in bold capital black font. The second example contains a magnifying glass icon. Extending below it is a rounded rectangle containing the word ‘SUGARS’ on top of the word ‘SUCRES’ in bold capital black font. The rectangle is white with a black outline. The third example contains a magnifying glass icon. Extending below it is three vertically stacked rounded rectangles. The rectangles are white with a black outline. The top rectangle contains the word ‘SUGARS’ on top of the word ‘SUCRES’ in bold capital black font. The middle rectangle contains the words ‘SAT FAT’ on top of the words ‘GRAS SAT’ in bold capital black font. The bottom rectangle contains the word ‘SODIUM’ in bold capital black font. Between symbols 1 and 2 is a modified Nutrition Facts table, with the saturated fat, sodium and sugars information bolded. All text is in mixed-case black font. Left justified at the top of the table is the heading Nutrition Facts and stacked below it is the heading Valeur nutritive. Both are in bold. The next line is Per 2 cups open parenthesis 50 g close parenthesis. The next line is pour 2 tasses open parenthesis 50 g close parenthesis. There is a thin rule below pour 2 tasses open parenthesis 50 g close parenthesis that spans the width of the table. The next line is Calories in bold followed by the number 270, also in bold. Right justified on the same line is the subheading percent symbol Daily Value in bold. Stacked under this is percent symbol valeur quotidienne also in bold. Both Percent Daily Value and percent valeur quotidienne are followed by an asterisk that refers to a footnote at the bottom of the Nutrition Facts table. There is a thick rule under the Calories information that ends after the number 270. It does not span the width of the table. Left justified on the next line is Fat, forward slash, Lipides, in bold, followed by 14 g. Right justified on the same line is the number 19 followed by a percent symbol. Indented on the next line is Saturated, forward slash, saturés followed by 4 g, in bold. Indented on the next line is a plus symbol followed by Trans, forward slash, trans followed by 0.2 g. Right justified and vertically centered against the saturated and trans fat information on the left is the number 21 followed by a percent symbol, in bold. There is a thin rule below the trans fat information that spans the width of the table. The next line is Carbohydrate, forward slash, Glucides, in bold, followed by 32 g. Indented on the next line is Fibre, forward slash, Fibres, followed by 2 g. Right justified on the same line is the number 7 followed by a percent symbol. Indented on the next line is Sugars, forward slash, Sucres, followed by 15 g, in bold. Right justified on the same line is the number 15 followed by a percent symbol, in bold. There is a thin rule under the sugars information that spans the width of the table. The next line is Protein, forward slash, Protéines, in bold, followed by 2 g. There is a thin rule under the protein information that spans the width of the table. The next line is Cholesterol, forward slash, Cholestérol, in bold, followed by 10 mg. There is a thin rule under the cholesterol information that spans the width of the table. The next line is Sodium, followed by 350 mg, in bold. Right justified on the same line is the number 15 followed by a percent symbol, in bold. There is a thick rule under the sodium information that spans the width of the table. The next line is Potassium followed by 75 mg. Right justified on the same line is the number 2 followed by a percent symbol. There is a thin rule under the potassium information that spans the width of the table. The next line is Calcium followed by 20 mg. Right justified on the same line is the number 2 followed by a percent symbol. There is a thin rule below the calcium information that spans the width of the table. The next line is Iron, forward slash, Fer followed by 0.5 mg. Right justified on the same line is the number 3 followed by a percent symbol. There is a thick rule under the iron information that spans the width of the Nutrition Facts table. The next two lines is the percent Daily Value footnote that was referred to at the beginning of the table description. The footnote starts with an asterisk followed by the statement: 5 percent symbol or less is a little,15 percent symbol or more is a lot and on the second line is an asterisk followed by the statement: 5 percent symbol ou moins c’est peu, 15 percent symbol ou plus c’est beaucoup. The terms ‘a little’, ‘a lot’, ‘peu’, and ‘beaucoup’ are in bold. All the above are enclosed within a rectangle. Symbol 3 is the Facts Up Front symbol. The symbol shows a light blue rectangle. Within the rectangle are the words ‘PER 1 CUP SERVING – PAR PORTION 1 TASSE’ in bold capital black font along the top. Below the text are six thumbnail shapes in white side by side. The first thumbnail contains the text ‘140’ in bold black font on top of the word ‘CALORIES’ in bold capital black font. The second thumbnail contains the text ‘1g’ in black font on top and just below it are the words ‘SAT FAT’ on top of the words ‘GRAS SATURÉS’ in bold capital black font. At the bottom is a horizontal black pointed oval shape with the text ‘5% DV/VQ’ in bold capital white font. The third thumbnail contains the text ‘410mg’ in black font on top of the word ‘SODIUM’ in bold capital black font. At the bottom is a horizontal black pointed oval shape with the text ‘17% DV/VQ’ in bold capital white font. The fourth thumbnail contains the text ‘5g’ in black font on top. Below it is word ‘SUGARS’ on top of the word ‘SUCRES’ in bold capital black font. The fifth thumbnail contains the text ‘1000mg’ in black font on top of the word ‘POTASSIUM’ in bold capital black font. At the bottom is a horizontal black pointed oval shape with the text ‘29% DV/VQ’ in bold capital white font. The last thumbnail contains the word ‘VITAMIN’ on top of the word ‘VITAMINE’ in bold capital black font. Below this is the letter ‘A’ in large bold capital black font. At the bottom is a horizontal black pointed oval shape with the text ‘20% DV/VQ’ in bold capital white font. Symbol 4 is the modified traffic light Facts Up Front symbol. This symbol contains four thumbnail shapes with black outlines side by side. The first thumbnail is white and contains the text ‘Calories’ in bold mixed-case black font on top of the number ‘100’ in bold black font. The second, third and fourth thumbnails are divided in the middle by a horizontal black line. The top half of the second thumbnail is orange and contains the word ‘Moderate’ on top of the words ‘Quantité modérée’ in mixed case black font. Just below is the words ‘Sat fat’ on top of the words ‘Gras sat’ in bold mixed case black font. The bottom of the second thumbnail is white and contains the text ‘4g’ in bold black font. Below it is a black circle with the text ‘20%’ on top of the text ‘DV/VQ’ in capital white font. The top half of the third thumbnail is green and contains the words ‘A Little’ on top of the word ‘Peu’ in mixed case black font. Just below is the word ‘Sugars’ on top of the word ‘Sucres’ in bold mixed case black font. The bottom of the third thumbnail is white and contains the text ‘5g’ in bold black font. Below it is a black circle with the text ‘5%’ on top of the text ‘DV/VQ’ in capital white font. The top half of the fourth thumbnail is red contains the words ‘A Lot’ on top of the word ‘Beaucoup’ in mixed-case black font. Just below is the word ‘Sodium’ in bold mixed case black font. The bottom of this thumbnail is white and contains the text ‘920mg’ in bold black font. Below it is a black circle with the text ‘40%’ on top of the text ‘DV/VQ’ in capital white font. Symbol 5 shows one black octagon with a large white exclamation mark in the middle. Three black bars extend out from the right side of the octagon. The top black bar contains the words ‘Sat fat/Gras sat’ in white mixed-case font, the middle black bar contains the words ‘Sugars/Sucres’ in white mixed-case font, and the bottom black bar contains the word ‘Sodium’ in white mixed-case font. The words ‘High in/Élevée en’ in black mixed-case font sit above the octagon and bars. The words ‘Health Canada/Santé Canada in black mixed-case font sit below the octagon and bars. The octagon, bars, and the words together are enclosed in a rectangle. Symbol 6 shows a large black exclamation mark. Beside it on the right, are three black bars. The top black bar contains the words ‘Sat fat/Gras sat” in white mixed-case font, the middle black bar contains the words ‘Sugars/Sucres’ in white mixed-case font, and the bottom black bar contains the word ‘Sodium’ in white mixed-case font. The words ‘High in/Élevée en’ in black mixed-case font sit above the exclamation mark and bars. The words ‘Health Canada/Santé Canada mixed-case sit below the exclamation mark and bars. The exclamation mark, bars, and the words together are enclosed in a rectangle. Symbol 7 is traffic light Facts Up Front symbol. It contains four thumbnail shapes with black outlines side by side. The first thumbnail contains the text ‘Calories” in bold mixed-case black font on top of the number ‘100’ in bold black font. The second, third and fourth thumbnails are divided in the middle by a horizontal black line. The top of the second thumbnail is orange with the words ‘Sat fat’ on top of the words ‘Gras sat’ in bold mixed case black font. The bottom of the second thumbnail is white with the text ‘4g’ in bold black font. Below it is a black circle with the text ‘20%’ on top of the text ‘DV/VQ’ in capital white font. The top of the third thumbnail is green with the word ‘Sugars’ on top of the word ‘Sucres’ in bold mixed case black font. The bottom of the third thumbnail is white with the text ‘5g’ in bold black font. Below it is a black circle with the text ‘5%’ on top of the text ‘DV/VQ’ in capital white font. The top of the last thumbnail is red with the word ‘sodium’ in bold mixed case black font. The bottom of this thumbnail is white with the text ‘920mg’ in bold black font. Below it is a black circle with the text ‘40%’ on top of the text ‘DV/VQ’ in capital white font. Symbol 8 is the modified Facts Up Front symbol in black and white. It contains four white thumbnail shapes with black outlines side by side. The first thumbnail contains the text ‘Calories’ in bold mixed-case black font on top of the number ‘100’ in bold black font. The second, third and fourth thumbnails are divided in the middle by a horizontal black line. The top half of the second thumbnail contains the word ‘Moderate’ on top of the words ‘Quantité modérée’ in mixed case black font. Just below is the words ‘Sat fat’ on top of the words ‘Gras sat’ in bold mixed case black font. The bottom of the second thumbnail contains the text ‘4g’ in bold black font. Below it is a black circle with the text ‘20%’ on top of the text ‘DV/VQ’ in capital white font. The top half of the third thumbnail contains the words ‘A Little’ on top of the word ‘Peu’ in mixed case black font. Just below is the word ‘Sugars’ on top of the word ‘Sucres’ in bold mixed case black font. The bottom of the third thumbnail contains the text ‘5g’ in bold black font. Below it is a black circle with the text ‘5%’ on top of the text ‘DV/VQ’ in capital white font. The top half of the fourth thumbnail contains the words ‘A Lot’ on top of the word ‘Beaucoup’ in mixed-case black font. Just below is the word ‘Sodium’ in bold mixed case black font. The bottom of this thumbnail contains the text ‘920mg’ in bold black font. Below it is a black circle with the text ‘40%’ on top of the text ‘DV/VQ’ in capital white font. Symbol 9 shows a black inverted triangle with a large white exclamation mark in the middle. Three black bars extend out from the right side of the triangle. The top black bar contains the words ‘Sat fat/Gras sat’ in white mixed-case font, the middle black bar contains the words ‘Sugars/Sucres ‘ in white mixed-case font, and the bottom black bar contains the word ‘Sodium’ in white mixed-case font. The words ‘High in/Élevée en’ in black mixed-case font sit above the triangle and bars. The words ‘Health Canada/Santé Canada’ in black mixed-case font sit below the triangle and bars. The triangle, bars, and the words together are enclosed in a rectangle. Does not tell you why – are these nutrients to seek out or to avoid? 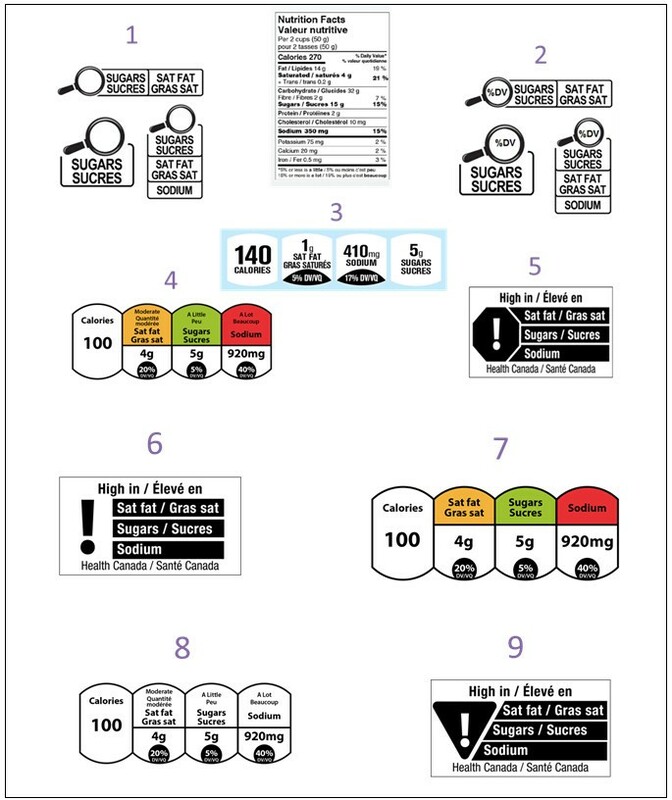 This figure contains drawings of two front-of-package symbol designs in black marker, proposed by Dietitians of Canada. The top symbol contains the words ‘Attention! High in/Elève (sic) en’, with two octagons below it side by side. The first octagon contains the word ‘Sugars’ on top of the word ‘Sucres’. The second octagon contains the words ‘Saturated fat’ on top of the words ‘Gras sat’. Below the octagons are the words ‘Health Canada/Santé Canada’. The words and octagons are enclosed in a rectangle. The bottom symbol contains the words ‘High in/Elève (sic) en’. Below this are two octagons and an exclamation mark side by side. The first octagon contains the word ‘Sodium’ and the second octagon contains the word ‘Sugars’ on top of the word ‘Sucres’. Below the octagons and exclamation mark are the words ‘Health Canada/Santé Canada’. The words, octagons, and exclamation mark are enclosed in a rectangle. The caution sign could be removed from the Health Canada proposals to make them less ‘alarming’, but this would take away the impact. The criteria for the FOP symbol should first and foremost reflect the public policy goal while putting in place measures to mitigate industry’s concerns. There needs to be a clear decision on colour, either one colour or black and white, as these would be the only options that align the ‘high in’ criterion. Good health is fundamental to a good quality of life and is critical to Canada’s prosperity as well. In the past year, there have been consultations on updating Canada’s Food Guide, restricting the marketing of unhealthy foods to children, and FOP labelling. Pierre Sabourin, Assistant Deputy Minister, concluded the meeting by re-emphasizing the public health imperative, the objectives of FOP nutrition labeling, and the next steps. Mr. Sabourin indicated that participants would receive a letter inviting them to submit revised symbols that are compatible with the evidence-based criteria discussed during the meeting. These evidence-based criteria are intended to help ensure the FOP approach achieves the public health objectives and align with Health Canada’s health protection legislative authority. Symbol submissions will be reviewed by Health Canada and used to form the basis of the next formal stakeholder engagement on the Health Eating Strategy, planned for November. Mr. Sabourin thanked all of the participants for their contribution as well as those who helped plan and organize the meeting. There is an urgent public health need to confront obesity and chronic diseases. Canadians eat too much sodium, sugars and saturated fat. This increases their risk of obesity and chronic diseases such as heart disease, diabetes and some cancers. FOP labelling is one of several initiatives that Health Canada is undertaking to help Canadians make healthier food choices. Along with improvements to the Nutrition Facts table and revisions to Canada’s Food Guide, FOP labelling will provide information that consumers need to make healthier choices. In his presentation, Dr. David Hammond cited a study that indicated that 80% of consumers consulted would like to support government policy that would require ‘high in sugars’ symbols on the front of food packages. FOP labelling is not new. Manufacturers have been using symbols and nutrition claims-such as ‘excellent source of fibre’ and ‘trans-fat free’-on the front of food packages for many years. FOP labelling has helped manufacturers highlight the positive attributes of food and to market their products. Based on a review of consumer research studies and international experience, Health Canada concluded that a mandatory ‘high in’ front-of-package labelling system is the most appropriate labelling tool to help address the burden of chronic disease in Canada. 3. What can we learn from Chile’s experience? Chile implemented ‘high in’ FOP labelling in 2016. An evaluation post implementation indicated that 92.9% of consumers recognize the symbols. In addition, 91.6% of consumers said it influences their purchase in some way (choose product with less warning, don’t buy, or purchase less). This study also determined that since implementation, 18% of products have been reformulated (e.g. 65% of dairy, 48% of processed meat products). 4. Will Health Canada’s proposed approach say that nutrient-dense foods are unhealthy?